As promised in my previous post, Getting More Gut Flora I mentioned an easy way to increase your probiotic consumption through lacto-fermented vegetables. This, I understand does not sound appealing, but honestly it is delicious and a much easier and quicker way of making chutney/relish type foods. It is filled with some carrots, sultanas, seasoning and lots of raw onions which are amazingly, cheap super foods. I made this recipe up last week, with what was in the fridge and horray – it was a success! I eat it with cheese, on my morning eggs, in a salad dressing, on meat balls – really anything! Onions are a a rich source of Quercitin, a brilliant antioxidant which helps lower LDL (bad) cholesterol, raise HDL (good) cholesterol, fight asthma, hayfever, contains Vitamin C and calcium as well as a host of other things. Onions are also anti inflammatory, anti viral and help boost the immune system. Basically, fall in love with onions, they are super cheap, a great bulker to make meat dishes stretch and help heal your body. Onions rant over, here is the recipe. Place the onions in the food processor and pulse until onions are a fine mince. Add the carrots and pulse until fully combined with onions. Place all other ingredients in the processor and blend until it is fine (or coarse depending on your preference). Get a clean and sterilised mason jar and put mixture in. 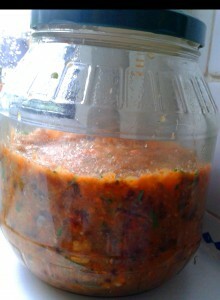 Use a spoon or potato masher to level the mixture up - you want a even, tightly packed jar of chutney. Leave it at room temperature for 3 days (this is the important part) then transfer to the fridge. If you don't have any whey, you could try using a few tbspns of organic probiotic yogurt instead, or emptying out a probiotic supplement (out of its capsule) into the mixture. I have never done it but in theory it should work, let me know if you try it. Hi Kezia, how long will the onion chutney last once in the fridge?